When most people think of Noah’s ark, they think of the animals. And have questions. We’ll talk about three here. For answers to six more of the most common questions about the animals on the ark, check out Noah: The Real Story—Could all the animals fit on the ark? How did the animals breathe and was there proper ventilation? What did Noah do with all the waste generated by the animals? How did Noah and his family feed and water 16,000 animals? How did the animals get to the ark, especially from far away? How did the animals spread around the world after the Flood? That’s all the Bible says about the animals on the ark. No part of the Noah story invites as much criticism or speculation as the animals. It’s easier to ask questions such as “How did Noah store enough meat for the lions to eat for a year?” than it is to answer them. No one can prove how Noah did something. They can just show it was possible to do something. Most answers come from those who believe an ark full of animals was saved from a global flood that destroyed the earth. They have to defend their position and show something was possible. Those who do not believe there was an ark full of animals and a global flood just have to ask questions and not worry about the answers. 1. How many animals were on the ark? Answer: A lot, but probably not as many as you might think. Does “kind” mean species? There are millions of species—somewhere between three and thirty million. Or does “kind” mean genus? A group of similar species is a genus. Or does “kind” mean family? A group of similar genera (the plural of genus) is a family. Canidae is a family that includes dogs, wolves, foxes, jackals, coyotes, and similar animals. Biological families number in the thousands, not the millions. Many animals did not need to be on the ark for survival. Sea animals, for instance, could survive a flood. Many of the one million species of insects could probably survive without being on the ark. John Woodmorappe, author of Noah’s Ark: A Feasibility Study, said if a “kind” means what we call today a genus, there would have to be just under 16,000 animals (8,000 genera). How many animals were on the ark? Perhaps as many as sixteen thousand. But there didn’t have to be hundreds of thousands. 2. Were dinosaurs on the ark? Answer: If dinosaurs were around, they would have been on the ark. Dinosaurs are fascinating because this diverse group includes the largest animals to ever walk the earth. Bones of one dinosaur found in Argentina suggest it was 100 feet long and weighed 100 tons. But although the Apatosaurus and the Tyrannosaurus Rex get the good press because of their size, most dinosaurs were relatively small—smaller than a turkey. Dinosaurs are said to have died out sixty-five million years ago. Noah is said to have lived 4,500 to 7,500 years ago. If you accept both of those dates, dinosaurs were not alive to get on the ark. However, if one or both of those dates is not accurate and dinosaurs and Noah lived at the same time, it raises interesting questions, the most common being how to get a one-hundred-ton animal on the ark. One answer is pairs of young dinosaurs—not old ones—would have been on the ark. (There are two orders of dinosaurs, each order consisting of a number of families.) God’s purpose in saving the animals was so they could reproduce and populate the earth. Younger animals would have been better suited for that purpose than older ones. It would be no small task to get a one- to two-ton young dinosaur on the ark and to feed it, but it’s a lot more reasonable than thinking a dinosaur on the ark had to be an eighteen-ton older Apatosaurus. 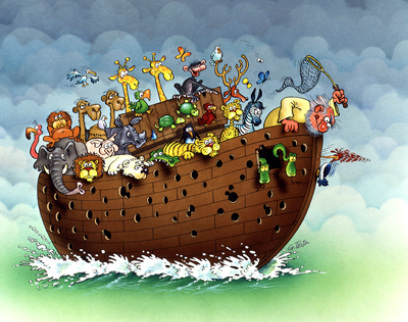 If dinosaurs lived at the time of Noah, they would have been on the ark. Mainstream geologists, however, say that dinosaurs died out more than sixty million years before humans appeared on the earth. Young earth proponents say dinosaurs and humans co-existed. 3. What did Noah feed the animals? Answer: Hay, grains, meat, and a lot of we-don’t-really-know-but-we-can-make-an-educated-guess. The Bible says God told Noah to take food for his family and the animals. But it offers no details about what that food should be. The most general answer is Noah fed the animals plants—hay, grains, leaves. More animals are herbivores (plant eaters) and omnivores (eating both meat and plants) than are true carnivores (meat only eaters). Cows, horses, rhinoceros, and elephants all eat grass and other plants. Some say the problem comes with the huge amount of hay required for herbivores. Noah could have used a combination of grain, which is far less bulky, and hay, which could have been compressed before putting it on the ark. Fruits and vegetables could have been preserved for the voyage by drying. We don’t really know how Noah fed the carnivores any more than we know how he fed the herbivores, but he could have taken along giant tortoises, each one weighing as much as 660 pounds. These tortoises have been known to hibernate in a ship without being fed or given water for a year or more. Noah could also have brought dried meat on board. It’s fascinating to discuss how Noah might have taken care of piscivores (animals that eat fish—for instance alligators and the bulldog bat), nectarivores (animals that eat the nectar of flowering plants—mostly insects and birds such as the hummingbird), frugivores (animals that primarily eat fruit—the orangutan’s diet is usually 65 percent fruit), insectivores (animals that eat insects—for instance anteaters and frogs), live-food eaters such as snakes, and animals with specialized diets such as giant pandas, which eat bamboo, and koalas, which eat eucalyptus leaves. But nothing can be said with any certainty. Noah might have fed the animals primarily hay, grain, and both dried and fresh meat. Speculation about what he fed those animals with specialized diets would go into far more detail than we can cover here, and would not lead any definitive conclusions. "Floreana History--Pre 1900's," http://divingthegalapagos.com/the-galapagos-islands/floreana-history-pre-1900s, posted July 28, 2009.